People who like to read and want to improve English skills can use cool online services like Engaging English. 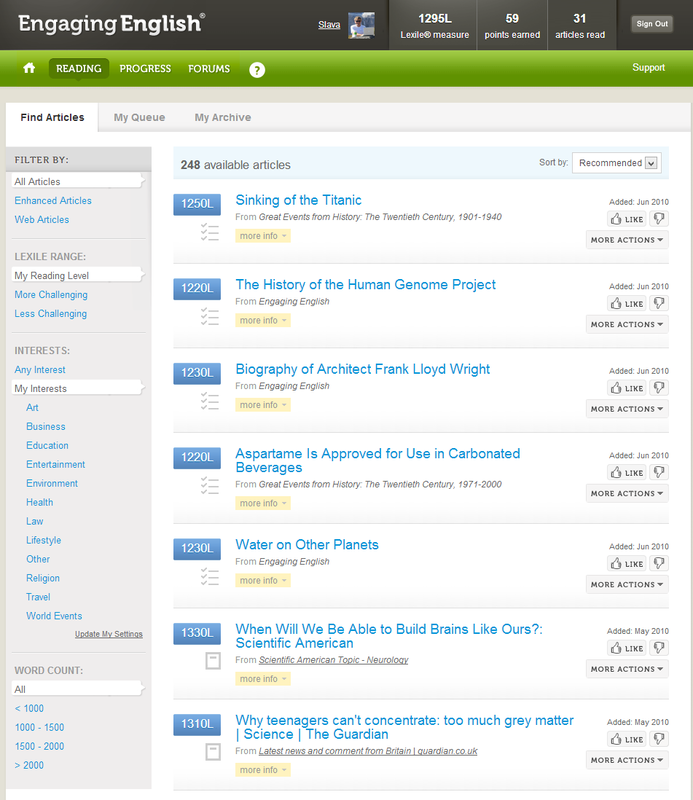 Non-native speakers like myself can use it as resource for online reading that offers daily, high-quality reading practice. Engaging English web site focused on your improvement for better reading, they help you read and improve more effectively, and also help you better track, appreciate your progress. As you improve, they help you keep reading at the edge of your skill level, maintaining this amount of challenge can help you improve more efficiently. For effective use, you need a basic level of reading proficiency. They are not a reading program or test prep course, and they do not give any instruction on how to read, however Engaging English is an online service that promotes high-quality practice and more active reading over time, they help you become the best reader possible to enhance your opportunities. I am not native American and I know that I need to improve my English and communication skills that is why I think it is best resource for me. 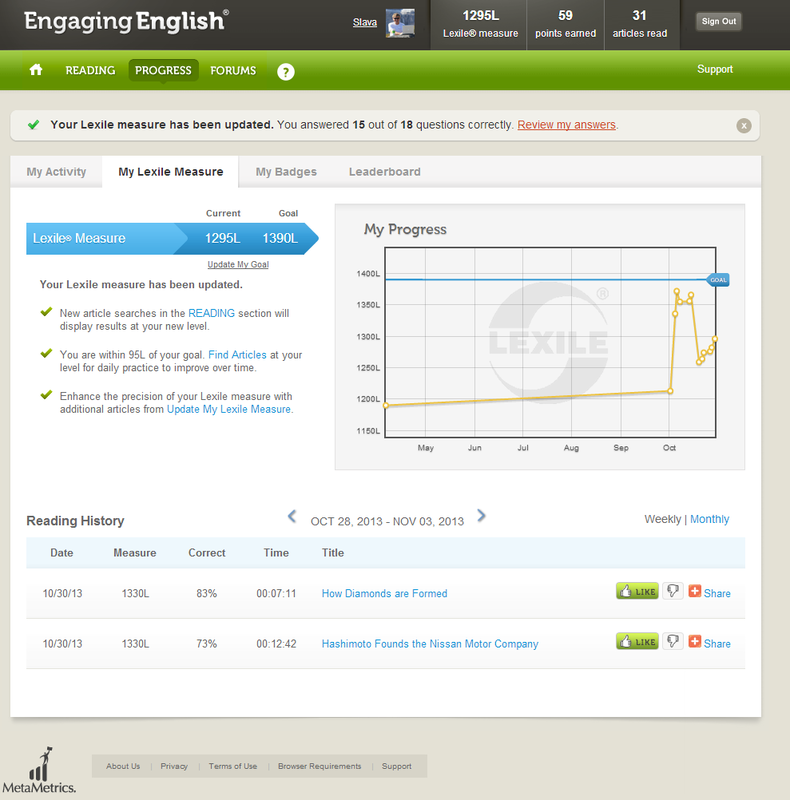 Engaging English is produced by MetaMetrics, the developer of Lexile measures, initially launched Engaging English in July of 2010, and welcomed first member (from South Korea) within minutes. Thousands more around the globe joined her during our first year of service. 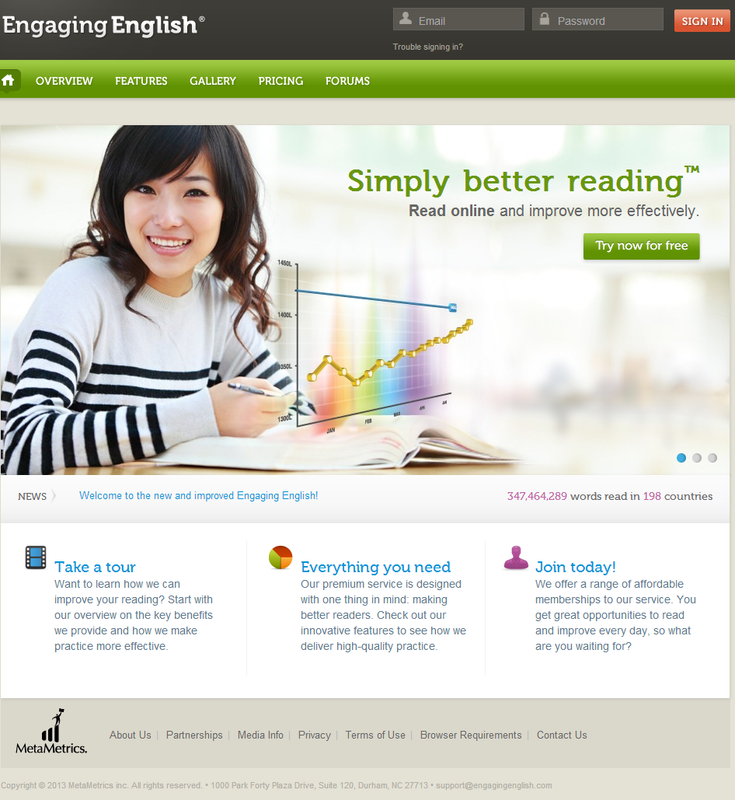 "The Engaging English service makes reading on the Web a genuine learning experience, enabling individuals to better manage their reading practice in a more intuitive and fun way," said MetaMetrics President and co-founder Malbert Smith III, Ph.D. "The most effective way to develop reading skills is constant practice. The Engaging English service makes that practice more efficient and accessible by using Lexile measures to match individuals with broad online content they want and should be able to read." In 1986, MetaMetrics was founded around the simple belief that test scores can be more useful. After years of research, The Lexile® Framework for Reading was born as a powerful, scientific way to connect assessment with learning. Today, more than thirty million students receive Lexile measures each year through dozens of popular assessment and learning programs. MetaMetrics have measured hundreds of millions of books and articles, and research is highly regarded for its distinct value across education. MetaMetrics is the company behind Lexile measures and Engaging English. It is a privately held educational measurement organization focused on technology to differentiate instruction and personalize learning. MetaMetrics, an educational measurement and research organization, develops scientific measures of academic achievement and complementary instructional technologies that enable individuals to attain their learning goals. The organization created the widely adopted Lexile measure, the standard for matching readers with texts. Lexile measures help learners of all ages strengthen their reading skills by connecting them with reading materials that provide the right level of challenge for their abilities and goals. Last year, MetaMetrics and ETS began offering TOEFL test takers the ability to match a TOEFL Reading section score with a Lexile measure at www.lexile.com/toefl. Linking a TOEFL Reading section score with a Lexile measure helps individuals practice reading English language materials more efficiently to improve their skills and better prepare for advanced academic coursework. The TOEFL test is the most widely accepted English language assessment worldwide. It is currently used by more than 7,500 colleges and universities in more than 130 countries. For additional information on the Engaging English service, visit www.EngagingEnglish.com. To learn more about the TOEFL test and the TOEFL Value Packs, visitwww.toeflgoanywhere.org/valuepacks. A Lexile measure indicates both an individual's English reading ability level and the text complexity of English materials on the same developmental scale. Lexile measures help individuals select high-interest books, articles and other texts that will provide an appropriate level of challenge for their reading level and goals. 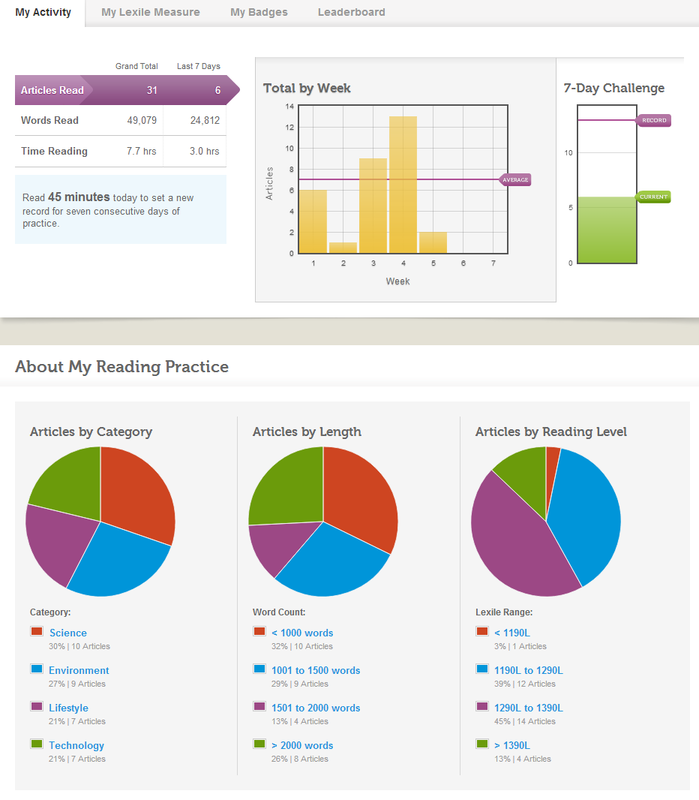 Lexile measures are expressed as numbers followed by an "L" (for example, 1050L) and range from below 200L for beginning English readers and texts to above 1700L for advanced English readers and texts. To learn more about the company, its capabilities and full range of offerings, visit www.metametricsinc.com. Can you try Engaging English for free? Yes. To try Engaging English with no obligation or commitment, sign up for a free trial. As a trial member, you can use Engaging English for 10 full days with no restrictions. If you wish to continue using our service, simply purchase a membership to keep your account active. "The Engaging English service personalizes the learning experience by connecting English language learners with current online texts that are matched with their individual reading abilities and interests," said Philip Tabbiner, Ph.D., president, ETS Global. "We are excited to offer this resource in our TOEFL Value Packs to provide test takers with a valuable tool to help them master the English language." Engaging English® service is an Internet- and membership-based reading service maintained by MetaMetrics, Inc. and hosted at www.engagingenglish.com. Success in reading enabled Engaging English to expand our research and development initiatives. This produced The Quantile® Framework for Mathematics and The Lexile® Framework for Writing, which made fast gains in adoption for their own distinct capabilities. They began exciting new work on next-generation assessments and personalized learning tools. This yielded many ideas, prototypes, and studies that produced new advanced technologies for improving reading. The disruptive potential came quickly into focus. I personally think that this is very good idea for startup, because English is international language and it is always a lot of clients to this service, from the other hand becase of passion and showcase for latest technology, and as a means to directly support English language learners worldwide. Global services team leads Engaging English forward with tireless vision and dedication, I like how each day, this team make it better and main goal is to provide members like me with the best reading service on the planet. Period. Sara, thanks for your comment. 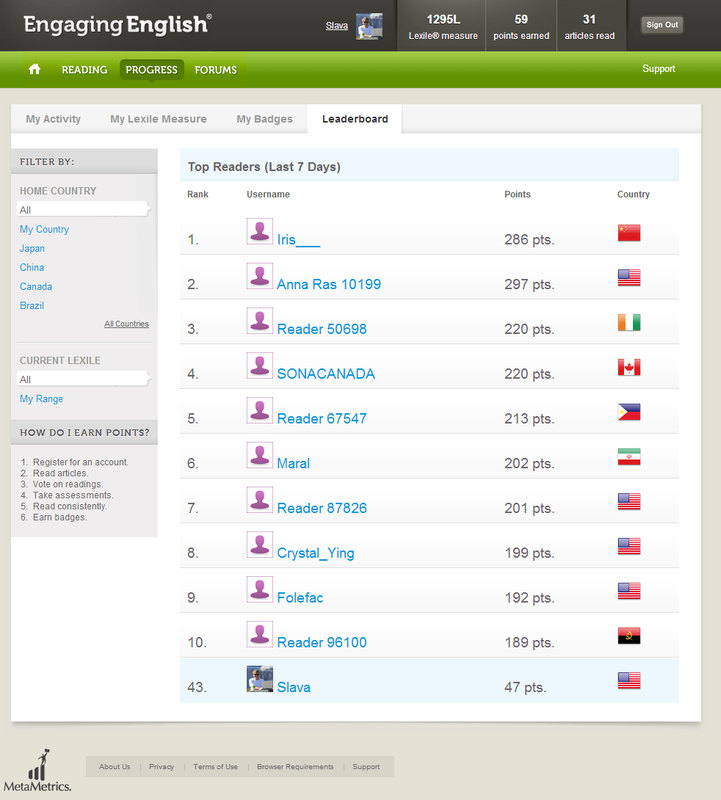 Yes, I agree with you and Engaging English helped me to pass TOEFL and get score that I want.